Ron Weil, "2012-221," 2012, charcoal on paper, 29 1/2 x 22"
Pairing artists is tricky: their work is usually related in theme or material, and aesthetically on the same wavelength; but also different enough so that they speak to each other. The works of Ron Weil and William Schwob work (and play) so nicely together that novice curators could study how this works to their benefit. 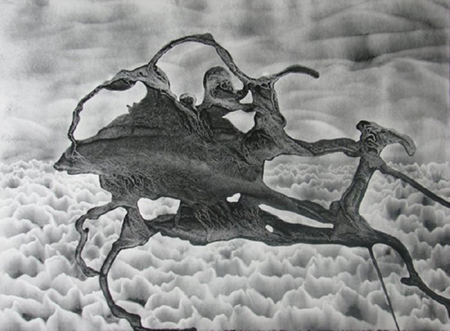 Weil makes virtuosic drawings in powdered charcoal, manipulating the messy, beautiful medium with special tools of his own devising, along with air, water and alcohol, in order to achieve complex textural effects that suggest both the eroded organic landscape forms of Surrealism and the spiritualized landscapes of Asian brush painting. The balance of accident and control in these untitled, numbered works, which never descend into mere effects, is astonishing. Schwob’s elegantly attenuated figures in wood-fired clay with their geologic-looking surfaces suggest unearthed artifacts from some vanished civilization, spooky yet beautiful. It’s tempting to assign them to the existential-ruin-sculpture club of Giacometti and DeStaebler. Some of Schwob’s titles take the influence of DeStaebler a step farther. The emergent/submerged muses/nymphs of Max Ernst’s 1940s decalcomania landscape paintings also come to mind. The show’s title, “Discovering Uncharted Territories,” ostensibly refers to geography, but also implies the quest of the individual creative spirit, an idea buried in recent years by trendier concepts, and ready, I hope, to be excavated and reborn.